Set on a 4-hectare park with a pond, this B&B is 2 km from Brissarthe and 18 km from Plessis Bourré Castle. It offers en suite caravans and a dining area located in the main building. All the heated, wooden caravans at Les Roulottes de la Brauderie offer garden views, wooden floors and a private bathroom with a shower. Outdoor furniture is available. Guests are invited to enjoy a continental breakfast in the dining room or in the comfort of their caravans. This B&B is 9.5 km from an equestrian centre and horse boxes are available on request. The property also offers free parking on site. 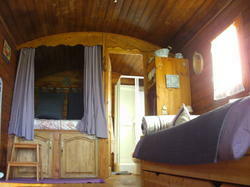 This wooden caravan with garden views offers a TV, a wardrobe and a private bathroom with a shower.